With so many calcium supplements to choose from, how are you to know which is the best calcium supplement for you? Below is a comparison between AlgaeCal Plus and the leading calcium supplement competitors. Caltrate is a very inexpensive calcium carbonate product usually sold with vitamin D2, the synthetic form of vitamin D which has been proven in clinical studies to be less effective than the natural vitamin D3 form.1a It is in a tablet form rather than gelatin capsules, and tablets are a less bio-available delivery system 2a The tableting requires many additives of questionable value such as “cellulose, crospovidone, FD and C blue No. 2, red No. 40, and yellow No. 6, Magnesium Stearate, polysorbate, povidone, sodium croscarmellose, starch, sucrose, titanium dioxide, triacetin”. Caltrate contains none of the other clinically proven bone building ingredients such as trace minerals, magnesium, Vitamin K2, and Strontium. Also, the calcium form does not compare to organic, whole food, plant-sourced AlgaeCal. 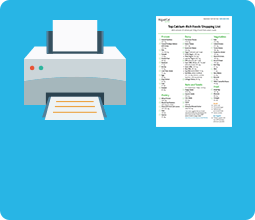 The price is very low, but it seems you are getting what you pay for – the lowest quality ingredients possible in the least bio-available form (tablet) along with a long list of additives. CalMax is laboratory-made Calcium Gluconate together with Magnesium and Vitamin C in an effervescent powder form. 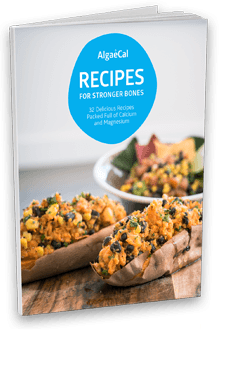 This product misses the mark for bone growth because it contains none of the other clinically proven bone building ingredients such as trace minerals, vitamin D, Vitamin K2, and Strontium. Also, the calcium form does not compare to organic, whole food, plant-sourced AlgaeCal. PremCal is inorganic calcium carbonate from limestone rock with an insignificant amount of Magnesium. It is available in three strengths of vitamin D to accommodate varying levels of sun exposure. This product has been positioned primarily for fighting PMS. PremCal misses the mark for bone growth because it contains none of the other clinically proven bone building ingredients such as trace minerals, Vitamin K2, and Strontium. Also, the calcium form does not compare to organic, whole food, plant-sourced AlgaeCal. Coral Calcium comes from above-sea fossilized deposits, or below-sea dredging operations which vacuum the coral sands, mainly from Okinawa, Japan. 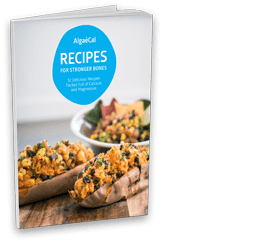 Coral Calcium was popularized in 2003 by a television infomercial which was later removed by the FTC/FDA for false and unsubstantiated advertising claims. The product was not in question so much as the exaggerated claims of disease healing that were made. Calcium Carbonate is the most common source of calcium on store shelves today, claiming about 70% of the market share. 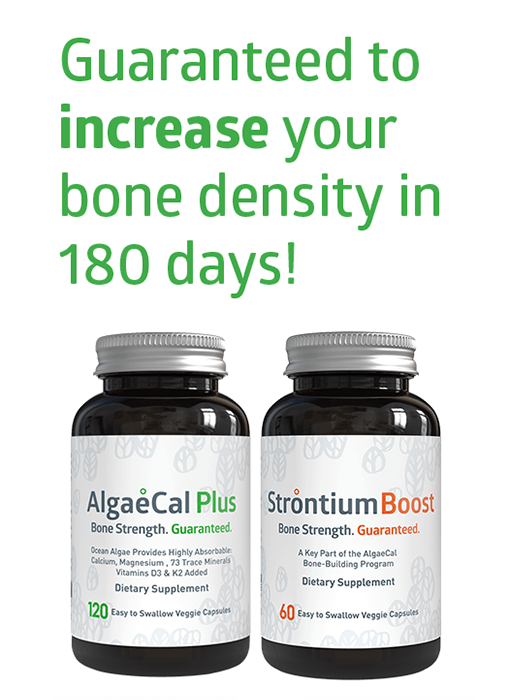 It is cheap and readily available, and has been used with moderate success in many clinical studies, mainly for slowing bone loss in post-menopausal women rather than growing new bone to any significant degree as we are accomplishing in the AlgaeCal Bone Health Program. Citracal Plus is calcium citrate (chemically bound) to Citric Acid in order to offer slightly higher bio-availability than it’s main competitor, Calcium Carbonate. 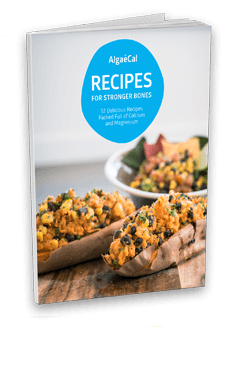 It is generally more expensive than Calcium Carbonate but really misses the mark for bone growth because it does not contain clinically proven bone building ingredients such as trace minerals, Vitamin K2, and Strontium. Also, laboratory-made calcium citrate does not compare to organic, whole food, plant-sourced AlgaeCal.